Yesterday's filter on instant messages containing links to TinyURL.com and is.gd happened to be a temporary mistake. Some sites, like MediaFire.com, are still victim of the feared server-side SPIM filter which Microsoft told us is run by a third party. Bram notified us that Microsoft has picked up the annoying habit of blocking links to well known domains sent over Messenger. TinyURL.com has entered the blacklist for the second time, but is.gd is a debutant exile. Admittedly, these URL shorteners can be abused to disguise links to harmful websites, but that's nothing compared to the value and usefulness of these services. Let's hope it's just a temporary blunder. However, while researching this news I've found that the ban on eBuddy.com has finally been lifted after more than half a year. If you discover any other blocked redirect services, let us know. Slightly later than expected, but Windows Live Essentials has been updated. 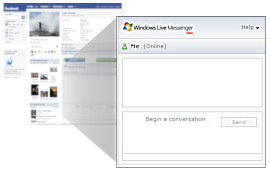 The suite includes the release candidate of Windows Live Messenger 2009 with build number 14.0.8050.1202. We'll update the list of changes below as we discover them (some of these items have previously been reported). Because nearly 200 bugs have been fixed, we won't go into listing them. - User interface has been updated, including the toasts. - Sign-in screen has been restyled. - Updated e-mail icon showing the number of new e-mails more clearly. - SkyDrive officially replaces sharing folders feature (Actions > View your online files). - Expanded What's new area shows more details (eg. complete Tweets, added pictures, etc.) and Post a note has been updated for some items. - What's new per contact in conversation window. - You cannot choose your own signature sound any longer. You can only assign signature sounds to your contacts. - Webcam snapshot has been renamed to Webcam Picture. - Tile with moods has been renamed to Dynamic Picture. - Modify moods, videos and/or pictures of previously made Dynamic Pictures. - Updated and new static/animated display pictures featuring the Messenger buddy, Morty and Daisy... Err, who? - Save pictures presented through PhotoShare (Previous photo/Next photo/Save photo). Messenger Plus! Live is compatible with this build although not fully functional. The Windows Live Messenger app for Facebook, with nearly 380,000 monthly active users, has been updated to support all 20 languages that both services offer. It's now available in English, French, German, Japanese, Korean, Traditional Chinese, Portuguese (Brazilian), Spanish, Swedish, Italian, Danish, Dutch, Finnish, Norwegian, Czech, Simplified Chinese, Russian, Turkish, Polish and Catalan. The Microsoft-built application enables you to show your online status on Facebook and allows people to contact you on Messenger straight from your profile. >> Add and configure the Messenger app for Facebook.